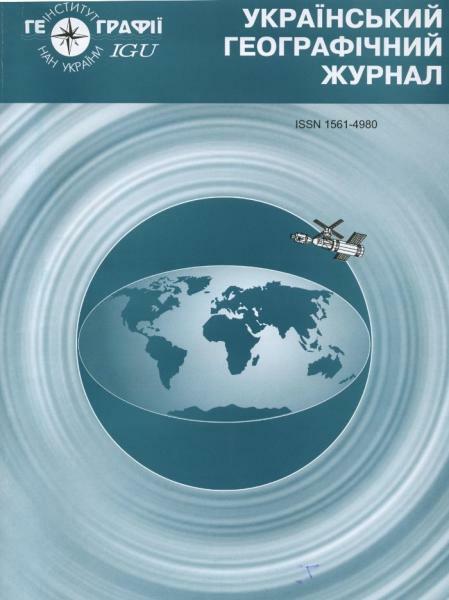 Editorial of the “Ukrainian geographical Journal” accepts the original, not previously published scientific articles which address urgent geography issues at the present stage of its development. Articles should be written in Ukrainian (for foreign authors English and Russian are acceptable). The article size is up to 250 000 characters. Structure of the article: UDC index, full name of the author or authors (in Ukrainian and English spelling), title, abstract, keywords in Ukrainian and/or English, full text, references, author’s place of work. In the article the following sections should be highlighted: Importance and relevance of the researched topic; current state of the researched issue; main works, purpose of the research; main material (may be with subsections); conclusions. The abstract should provide concise form of the main points in accordance with provisions of the article structure (800-1000 characters). References to original sources in the article should be made in square brackets according to the number on the reference list. Charts, cartographic materials and illustrations should be numbered and cited in the text. All graphics must be computer designed, black and white in one of the following formats: TIFF, BMP and JPEG with resolution of at least 300 dpi. Be sure to submit separately electronic files of drawings, graphs, charts, etc. Color drawings are not acceptable if the question is not agreed beforehand with the editors. Rules for printing form. Text should be typed in Microsoft Word with all the formulas and charts. Files are accepted via email. Along with the electronic version two (2) printouts of the article text should be submitted. Printout must fully match the computer files. Starting with UGJ № 2-2015 editorial board initiated the receipt of The Digital Object Identifier (DOI) for scientific articles – the universal search hyperlink to publications on the electronic scientific network.